If you want to see how likely it is that Melbourne Airport will see a rail link built, just take a look at the recent business decisions made by SkyBus – the operator of the only public transport link between it and the Melbourne CBD. SkyBus commenced operations in 1978, running a shuttle service between Tullamarine Airport and Franklin Street on the northern edge of the Melbourne CBD. In 1982 it took over the airport bus services run by the now-defunct airlines Ansett and TAA, with the service taking the current form in 2000 when the city terminus was moved to Spencer Street Station, with services operating express to the airport. 2002 then saw the state government contributing $3 million in funding to upgrade the service in place of the construction of an airport rail link. Articulated buses were introduced to the service in 2002. With the first Bustech “CDi” double deck buses entering service in 2015. Travel times were once advertised as 20 minutes from airport to the city, but increasing congestion saw the claim gain a “times may vary due to traffic conditions” disclaimer, then dropped altogether in 2016. The monopoly nature of the SkyBus service saw private equity firms take in interest in the company, with two foreign firms taking a majority stake in the company in 2014, in a deal valuing SkyBus’s parent company at $50 million to $100 million. It appears that the new management realised that their gravy train of monopoly profits on the Melbourne Airport – City route wouldn’t last forever, as they soon started acquiring other airport bus operators across Melbourne, Australia, and even New Zealand. SkyBus purchased the Airbus Express service in Auckland, New Zealand. SkyBus took over operation of the Avalon Airport – Geelong route from Murrell Group. Skybus launched a new direct airport express for Southbank and Docklands. SkyBus purchased the Gold Coast Tourist Shuttle (GCTS) service in Queensland, rebranding it as SkyBus. Skybus launched two new airport bus services: Melbourne Airport to Tarneit and Werribee; and Melbourne Airport to the Mornington Peninsula via Rosebud, Mordialloc and Mentone. SkyBus purchased the Hobart Airporter service in Tasmania, rebranding it as SkyBus. The reality is, just because you build an airport rail, it doesn’t mean people want to use it. Yes, let’s plan for the next 15 or 30 years, but let’s also be somewhat sensible in this conversation by recognising we’ve had a service for over 38 years, which over 50 million passengers have used. We think we can co-exist with rail and provide a very competitive offering. If we ever have an airport rail, it has to deliver all those value points for customer experience. Melbourne Airport warrants and deserves many modes supplying the highest level of customer experience, and we think SkyBus will be one of those. But by 2018 they were more worried, questioning the government for choosing to subsidise a competing rail link. But experience at overseas airports shows that SkyBus will survive – many passengers will still choose an airport bus over an airport train, with one example being Hong Kong. 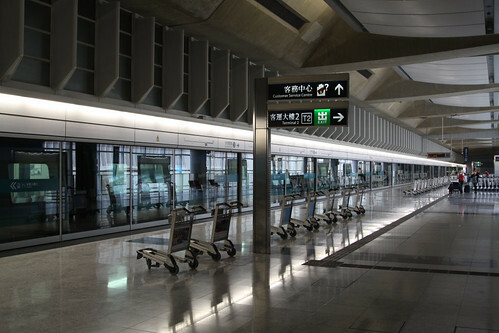 Hong Kong Airport is served by an airport rail link that overseas visitors love to rave about. But it is the network of direct bus services that have captured the market. In general, public transport modes dominate HKIA ground access market. Franchised buses have a large proportion (47 percent) with the Airport Express rail line (AEL) having 23 percent. The primary reason attracting air passengers to use the franchised buses is the lower travel cost. ‘Shortest time required’ is the main reason for those who used AEL. In order to understand the motivation for mode choice – and to explore the attribute of directness of service — MTR managers undertook some market research. Of those riders on the direct bus routes, an expected 55 percent said that the lower fare was a reason for choosing the bus; importantly, 51 percent stated that directness of service (i.e., no need to transfer) was a reason for their choice of mode. Directness of service was considered a factor by only 18 percent of rail riders, presumably those with destinations convenient to the terminals. And that even throwing money at a gold plated rail service will do little to attract additional passengers. It is apparent that even with a good design and well-integrated railway service, the Airport Express does not have inherent advantages over more direct single mode bus travel. In other words, the speed advantage of rail versus single mode road competitors when travelling over distances of only up to 34 km [21 mi] do not result in significant enough time savings to compensate for the necessary transfer. Which also provides lessons for the State Government on how to deliver a Melbourne Airport rail link. So what will Melbourne Airport rail do to SkyBus? 2018 saw the the signing of a new 10 year contract between SkyBus and the State Government, so it doesn’t look like SkyBus is intending to go anywhere. I suspect that the Hong Kong experience will also play out in Melbourne – patronage on SkyBus’ primary Melbourne Airport to CBD route will plummet, with passengers switching to rail based on cost if it is a extension of existing suburban services, or quality if it is built as an express airport link. As for the other SkyBus routes recently launched to other parts of Melbourne, patronage will stay much the same, with the one seat journey being preferred over a change trains in the city. 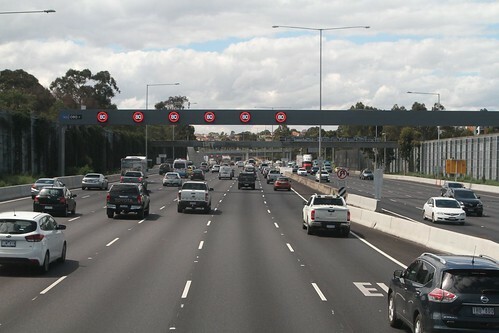 However the real competition will be driving directly from home to the airport, over a freeway network that the State Government continues to expand. There is more than one way to get to Melbourne Airport, as Daniel Bowen describes in his post The cheap way to Melbourne Airport. There are also a other privately operated bus services that run from Melbourne Airport towards Dandenong and Ringwood, as well further afield to Geelong, Ballarat, Bendigo, Gippsland and Shepparton. Until the early-2000s SkyBus used full sized coaches for the trip out to the airport – ‘The Tulla Flyer’ has posted a selection of photos from this period on the Australian Transport Discussion Board. Photos of the former SkyBus terminal at Spencer Street Station can be found at the ‘Showbus Australia’ website. I was on the SkyBus late last week, and coincidentally on the Tulla at the moment there is a billboard ad from SkyBus “.. As Melbourne’s population reaches 5 million, we welcome the airport rail link”. Should read ‘5 million’, not ’25 million’. ‘Twas too early in the morning. Interesting find – pity I can’t find a version of it online yet. The airport buses serving the Dandenong area tend to wander off the direct route in the quest to have stops in the St Kilda area like the Frankston ones do – somewhat of a turnoff from using them given you typically just want to go to the airport and meandering up Inkerman Road is typically not part of that journey by choice. Wonder if a gradual Skybus monopoly would change that given they have a dedicated St Kilda service. Their list of stops between Dandenong and the city is extensive! Be sure to check you are boarding the Dandenong Airport Bus at Dandenong Station and not the 901 SmartBus. The 901 takes more than 4 hours to reach Melbourne Airport and you will miss your flight. Airport rail was always a stupid idea. They learnt that lesson in Sydney, where the route is only viable because it continues on past the airport and serves an entire train line. So, how would we even do it in Melbourne? And what is the damn point? We already have the 901 route. It links directly with Broadmeadows and the northern suburbs for all of those cheap people like myself. It’s a pain to walk all the way down, it’s literally at the far end of the bus terminal. We cannot get a better service then SkyBus with rail. It will pull in to Southern Cross station, where some train lines won’t even terminate. I have a better vision, much better. People travelling to the airport don’t come from the city, so, we implement an outer loop rail line passing under the airport, and looping around the outside of the city where most the people who use the airport actually live. Patronage on smart buses is at an all time high. So run the train line, it will directly link with pretty much all train lines. We can easily build it alongside the ring road for most of the journey. Plenty of space, and as a result, car traffic on the ring road will also decrease, and this road is clogged as and the extra lanes are a waste. There are so many people on those smart buses, more case for an outer loop then a Doncaster rail surely. I wouldn’t call route 901 route in the current state a replacement for an airport rail link – the lack of bus priority made it a slow ride every time I’ve taken it. Skybus is the only bus service in Victoria where the bus company pays the State Government rather than the norm of the Government subsidising the bus. They pay a fee to the Government in order to maintain the monopoly. If you have ever caught the overcrowded Skybus in the evening from Tullamarine to the City, you would be wondering why there isn’t a second operator to provide some competition – the best way to stop overcrowding. That’s not to say that Skybus don’t do a good job. They provide a frequent service 24 hours a day in clean modern vehicles. Since the Canadian funds took over, there seems to be a determination to take over all airport bus services. The methods used to take Melbourne -Avalon off Sita and the Geelong – Avalon service off Murrells was not the most ethical business moves around. They have made bids to try to get the Gull service off it’s Geelong owners. Gull are hanging on but Skybus responded by advertising a joint effort with V/Line where you catch the train from Geelong to Tarneit and join the new Skybus service there. I’m guessing the other airport buses aren’t considered a ‘franchised’ bus so no money changes hands between government and operator? Avalon Airport Shuttle will be ceasing the operation of our “door to door” service which meets every flight this coming Friday (The 7th of July). We received notice last week that Avalon Airport has declined to extend our access agreement leaving us unable to operate out of the airport. We have operated out of (and supported) Avalon continuously since its inception in 2004 and are very disappointed at the decision the airport has made. Where have you seen the joint V/Line / SkyBus promotion? I haven’t been able to find anything online so far. I travel to Melbourne Airport often. The Skybus is excellent, compared to similar services overseas. It is expensive but competitively priced compared to the Sydney and Brisbane Airport trains. I have also taken the bus to Broadmeadows and train option. Depending on how long you have to wait for the 901, it takes between 30 and 60 minutes longer. I check the 901 timetable before I set out. I’ll trade half an hour for $16 bucks price difference but not an hour. I took the 901 to Frankston once. Once was enough. It is pretty good connecting up the northern suburbs though. People who think the train will be better, are heading for a big disappointment, I think. It is going to be a huge waste of money which could be better spent on other things. It will be slower than the Skybus is. Downtown Melbourne’s trains are a joke. The loop is idiotic. Travelling from Frankston to Broadmeadows becomes a nightmare where you end up going around the loop one and three quarters times. Or there are no trains from Parliament to Richmond. Or when you arrive at Flinders Street, if you are on the train there is no way to figure out where it is going next. A few weeks ago I caught a train which actually went from Frankston to Craigieburn which seems a bit unusual. When I lived on the Craigieburn line the train plus route 901 bus worked well compared to Skybus – but driving direct to the airport still won!